Do you ever find yourself wishing for a different reality? I will admit that I have spent time over the last couple of weeks dwelling on realities other than my own. The more I thought about it, the more anxious and depressed I got. If I’m not careful, dwelling on the seemingly perfect lives of others can easily cause me to tail spin into a deep, dark, hole. Oh, I didn’t go there. But I could have. Or maybe I did and I just don’t want to admit it. Exhaustion has often found me on the couch spending extended time “catching up on social media”. I love connecting with friends and family through Facebook, Instagram and through blogging, but when I am feeling low and have the wrong perspective of my own life, looking at the seemingly perfect lives of others can throw me for a loop. A blogger shared pictures of her beautiful new home, and I found myself desiring a bigger house. Another shared about the birthday surprise her husband went all out and did for her, and I found myself longing for the romance that existed in my marriage long ago. Perfect recipes photographed, children running and laughing, life lived full right before my eyes and I wonder why I seem to be stuck in the mundane. What am I chasing after? What reality is it that I am seeking? I want to be thankful for this life that God has so graciously blessed me with and embrace my own reality. I am alive. I have a loving and committed husband who works hard to provide for our family. I have four beautiful children and a son-in-love who pursue the Lord passionately with their gifts of worship. I have a job, serving my Pastor and church community at a place where I am privileged to use my gifts of administration, worship and the arts to glorify the Lord. And, I have numerous friends, both in-real-life and through cyberspace that God has brought to me. They are treasures, gifts to me. I should be more thankful. I am tired, and often don’t have the energy to do all that I want to do. But today, I am embracing the reality that I am healthy and His strength resides in me. My house is not that clean. It’s actually a mess right now. But today, I am embracing the reality that I have a place to call home. I don’t have a lot of money. We struggle in so many ways. But today, I am embracing the reality that God cares for our basic needs. But today, I am embracing the reality that His mercies are new every morning. I don’t always agree with my husband or show Him Christ’s love. But today, I am embracing the reality of a man who loves me unconditionally, no matter what. I sometimes get frustrated at my job, or that I have to work at all. But today, I am embracing the reality that I get to work in place where God is glorified. My reality may not look like everyone else’s reality, but it is mine. And today, I am embracing my reality with a heart of thanksgiving. What does your reality look like today my friend? Will you offer up thanksgiving to the Lord today for all that He has given to you? Such a true and transparent post. I love your outlook. Today, I will look at the positives and good things as so often we fall into the trap of lusting after another’s things. We do not take them with us so why stress over it. God is in control. As long as I am longing after what other’s have, I cannot fully life my life in joy. So thankful God continues to give me His perspective. Thanks for stopping by Kristen. Wow! My heart is touched by the way you turned every “accurate” statement on its head to find a truer perspective. This is a continual discipline, don’t you think? – to really see how God sees. We don’t need to deny or ignore, just put on some rose-colored glasses. Thanks for stopping by Laure, and for the reminder to look at life through rose colored glasses. I’ve been counting blessings found in a deployment and one thing I’m thankful for is how it is teaching me to appreciate the small things….like hugging my husband every morning before he leaves. I too can have my moments of searching for a different reality but oh this reality of mine there is so much to embrace! I always love your honest and beautiful heart. And it makes me smile big when you join us for Three Word Wednesday. 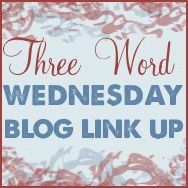 I love the Three Word Wednesday. And yes, we both have so much to embrace in this life God has given to us. Hugs! Refreshingly real. Sometimes just the slightest perspective adjustment can change how we view our reality. I’ve heard it said that in order to appreciate all of the blessings in our lives, we must first imagine life without them. I like the idea of embracing our realities. I touched on this not long ago, embracing our personal truths. As you say, it isn’t easy sometimes, but can also be freeing. Your honesty and transparency is a blessing, Barbie.